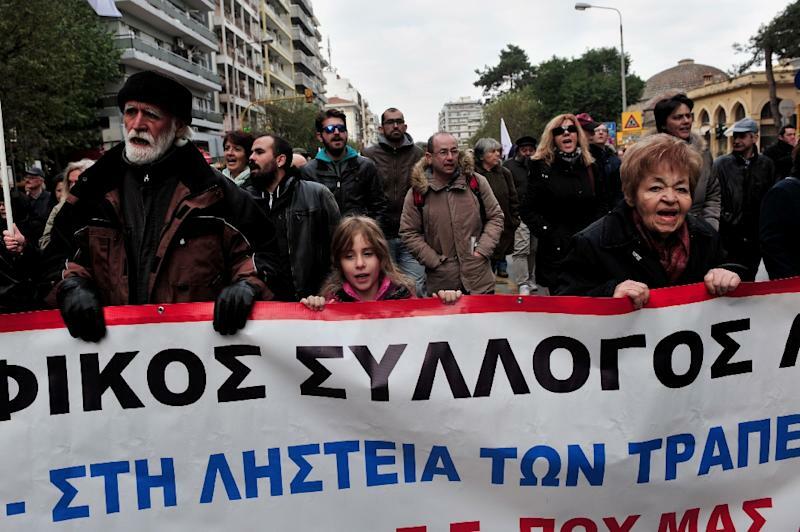 Athens (AFP) - Thousands of Greek trade unionists demonstrated on Thursday against planned new cuts demanded by international creditors in a general strike that shut down several key sectors. 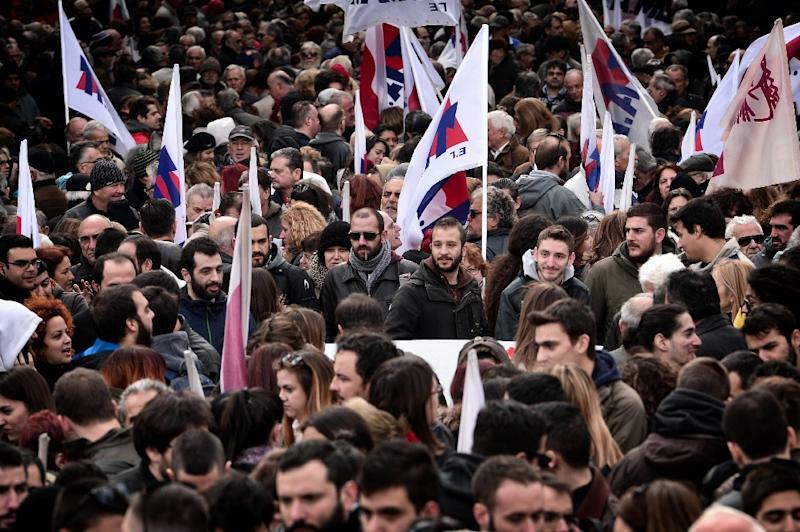 According to police, some 15,000 people took part in separate union protests in Athens and another 5,000 in Thessaloniki. Civil servants, bank staff, merchant seamen, railway workers and state-employed doctors were among professionals taking part in the 24-hour stoppage against the measures, which are scheduled to be approved by lawmakers at the weekend. The country's international creditors -- fellow EU states and the International Monetary Fund -- want Greece to overhaul its labour legislation to make crippling strikes less likely while also facilitating layoffs. Official data on Thursday showed persistently high unemployment figures at 23.1 percent in September, with an increase of some 60,500 jobs compared to a year earlier. Unions say hidden unemployment is far higher. A new budget containing around one billion euros ($1.07 billion) from extra taxation on items including cars, fixed telephone service, pay TV, fuel, tobacco, coffee and beer is to be approved by parliament early Sunday. Public spending on salaries and pensions will also be cut by 5.7 billion euros next year. Unions are also angry about plans to raise over 2.0 billion euros next year from privatisations, including 1.2 billion euros from the sale of regional airports. "These (austerity) policies worsen our living standards every day," said Evi, a Communist unionist who declined to give her surname. Seeking to sweeten the pill, Prime Minister Alexis Tsipras announced late Thursday new measures to help pensioners and the Greek islands in the frontline of Europe's migrant influx. In a televised message, Tsipras announced the reinstatement of a 13th-month annual payment on the lowest retirement pensions, a benefit which had previously been removed as part of austerity measures. The government will also postpone the planned sales tax rise for the east Aegean islands, which currently hold more than 16,000 migrants and refugees, the prime minister added. "The time has come for Europe to recognise that Greece is carrying a load for the whole of Europe, both with the refugee crisis and the economic crisis," Tsipras said. He stressed that the new measures would not breach a third major loan deal reached with the country's EU and IMF creditors in 2013, as this year's primary budget -- not including debt repayments -- had bettered the fiscal goals. Already huge, Greece's debt after the three consecutive bailouts is on course to reach a mammoth 315 billion euros, or around 180 percent of gross domestic output this year, according to the latest EU data. Greece on Tuesday rejected pressure to extend its painful austerity programme beyond 2018 as part of a deal to bridge differences between the squabbling international creditors.